This is a designer ornament handmade by artists at the Glass Eye Studio in Seattle, Washington. The glass is recycled and contains ash from the 1980 Mt. St. Helen's eruption. 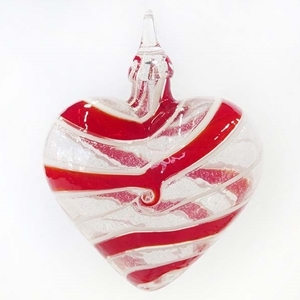 This heart shaped piece has a clear and red candy cane swirl with sparkly flecks in the clear areas and occasional twists in the spiral. It is approximately 3" wide and tall.